Star-Lord, Groot, Rocket and the rest of the gang are back with 2017 Upper Deck Guardians of the Galaxy Vol. 2 trading cards. Like the set based on the original film, there’s a cardboard mixtape including more autographs from the movie’s stars and a pair of memorabilia cards per hobby box. 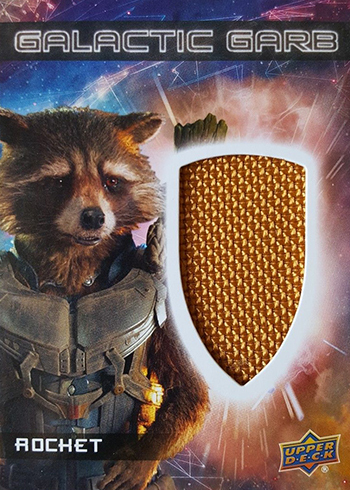 While the product does lean towards a more high-end configuration with regards to three premium inserts per hobby box, it’s not to quite the same extent as some of Upper Deck’s other recent Marvel products like Doctor Strange. 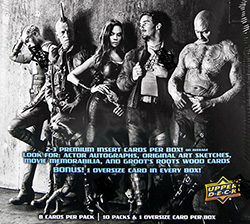 The 2017 Upper Deck Guardians of the Galaxy Vol. 2 main set has 90 total cards. It’s divided into two parts. The base portion, which highlights parts of the story, consists of 80 cards. The final ten are dedicated to characters and movie posters. Parallels come in several colors and combine to land one per hobby pack. Bronze Foil are the most common, landing approximately two out of every three packs. They’re also the only hobby parallels that aren’t serial numbered. Those that are come in Blue Foil (/199), Purple Foil (/99), Red Foil (/49) and Pink Foil (/10). 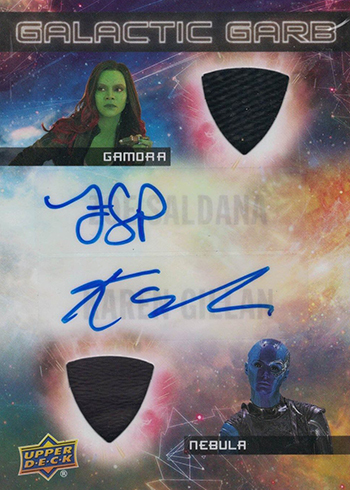 2014 Upper Deck Guardians of the Galaxy arrived with a deep checklist of signers highlighting most of the main cast. Many of these were also among the actors’ first certified autograph cards. Both single and dual Actor Autographs return in 2017 Upper Deck Guardians of the Galaxy Vol. 2. Signers this time around include David Bautista (Drax), Zoe Saldana (Gamora), Karen Gillan (Nebula) and Pom Klementieff (Mantis). Most have a multiple signed cards that use different numbers on the back. 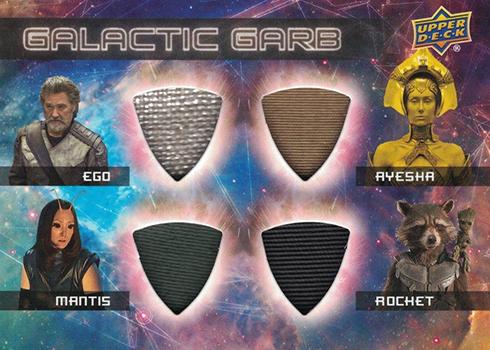 Galactic Garb takes up the mantle for the memorabilia cards. These have between one and four swatches. Each hobby box has at least one memorabilia card. Autographed memorabilia cards are also available with one and two signers. 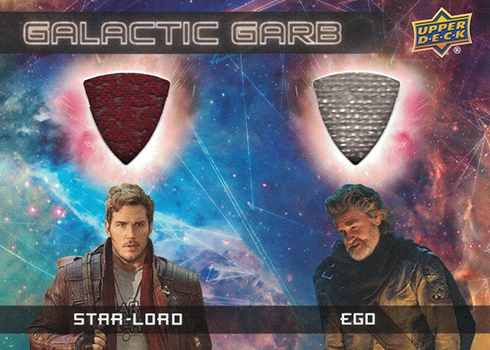 2017 Upper Deck Guardians of the Galaxy Vol. 2 trading cards have a handful of other inserts. Behind the Lens, Spaceships and Family of Oddballs are on the easier side, each landing 1:3 packs. 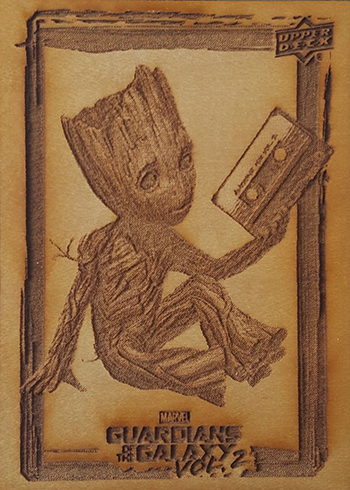 New to this product are Groot’s Roots wood cards. These premium inserts are printed on maple. For sports collectors, the style may be a little reminiscent of the Lumber Yard inserts found in 2002 Upper Deck 40-Man. 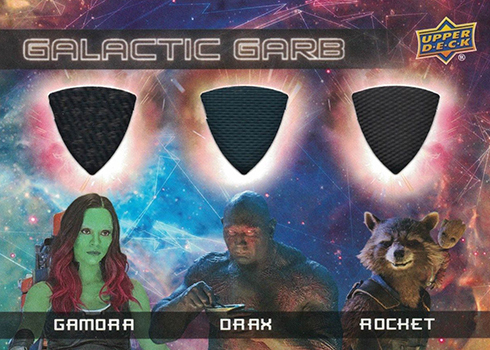 Finally, like the first film’s set, 2017 Upper Deck Guardians of the Galaxy Vol. 2 has 5 x 7 box toppers. Sketch versions are randomly inserted as a case hit. SP (#81-90) – 1:3.33 packs.